You’d think he’d be cruisin’ around on a Harley or Indian; but no, The Boss, aka Bruce Springsteen, has Triumph as his selected ride. Good Choice! Here on what looks like a late 60’s TR6C Trophy. High pipes, small headlight, no tach and single carb give that away. That was then, this is now… the passion still burns! Actor Ryan Reynold, yes The Green Lantern, here scooting around Hollywood on a cafe’d Triumph Thruxton. Blacked-out pipes & ‘gin, chopped fender & bellowed forks; Ace bars, smaller headlight and a cherry of a tank tops it off. Toting gear in a leather satchel, whilst trying to appear anonymous. 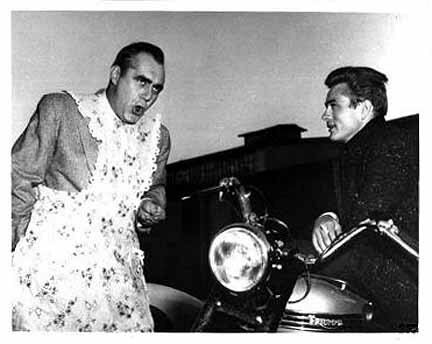 Dunno ’bout him, but that Hinkley Moto is a real head turner! “Let’s roll Pilgrim!” Usually seen atop a big horse, here we see the Pappy of all Action Heroes aboard a Honda dirt-bike. Dressed in his Big Jake garb, ready to give chase to some gang of outlaws. A fairly recent film from Canada starring Joshua Jackson (of Dawsons Creek, Fringe etc.) also has a starring role for a Norton Commando. The story’s premise is our main character learns he has cancer so decides to ride across the country to the west coast in search of himself. Carefully played, beautifully shot (especially the riding scenes) and a fine movie to see. Josh obviously enjoys Brit Iron; seen here below, begoggled, on a later model Triumph. A beautiful trio: the burly and sublime B-17 Flying Fortress (which I luckily got to fly on earlier this year with my father); an Ava Gardner looking brunette beauty; and a classic Norton Dominator (Dommie). evocatively shot by photographer Giles Clement. Mid-nineties Triumph Speed Triple: the gentlemans Monster! One of my favourite motos: hefty black lumps of an engine; clip-ons and fiery colour scheme. Designed from tire to tailpipe for winding roads! Our Man McQueen fettling his Triumph TR6 prior to taking part in the 1964 International Six Day Trials ISDT. A true test of rider and his machine. An unusual adaptation of a 70’s oil-in-frame Trophy. A pair of motocross forks, wide bars, an alloy uni-link swingarm, sportsbike wheels and tires, and to top it off, a dirt track seat and I’m sure some interesting engine internal upgrades and I bet this is a G-R-I-N inducing ride. A back road scratcher for sure! A book cover graphic with a whizzing wheeled, wheelie-jumping twin ridden by begoggled rider; possibly a Triumph or Norton. Great 70’s look and neat title: ‘Wonder’ being the operative word. I wonder what goodies would be found in these pages…. …it seems to cover everything about motorcycling! It’s also written by a certain Robin Lawrie; my fathers name. I’ll have to search out a copy for my motolibrary. Bruce Dern appearing roguish with his lightly customized Triumph; cowhorn bars, peanut tank and sissy bar. 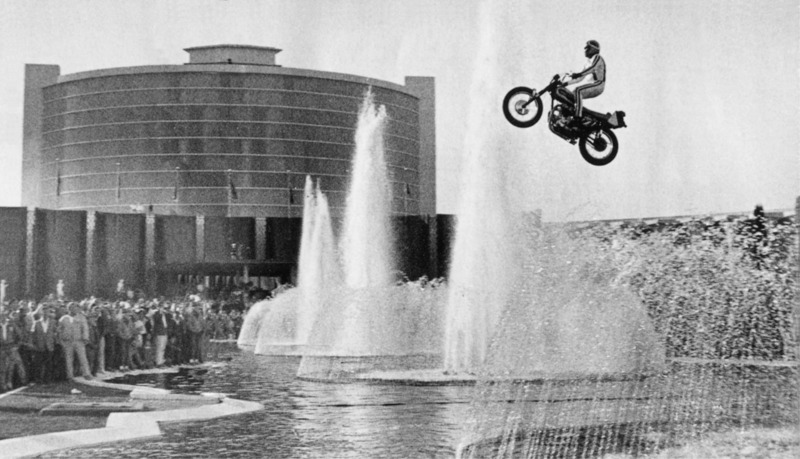 A stunning photo our our daredevil friend Evel Knievel jumping the fountain at Caesar’s Palace in Vegas. What a showman! Lovely Thunderbird sits waiting for a twist of the throttle. Fancy a ride up to the Observatory?